Catatumbo River / Maracaibo Lake “Lightning Tour”. After driving through the spectacular foothills of the Andes and embarking on a boat for your transfer to a quaint fishing community near the shores of Lake Maracaibo. Enjoy an afternoon wildlife tour in a fishing boat looking for river dolphins, birds and howler monkeys that live in the forests and mangroves alongside the lake before retiring to your hammock for the night. Then from the comfort of your hammock just lying there and enjoying the lightning “show” phenomenon over Maracaibo Lake, a show that goes on every night virtually 365 days a year and 366 days on a leap year! In the morning after breakfast we will visit the impressive rain forest of the western Andes, which is almost as beautiful as the Amazon jungle itself and do a short “jungle trek” – your expert guide will then take you on a butterfly “photo safari before you return to Mérida via the Andean villages of La Azulita and Jají perched high in the Andes – with spectacular vistas all around. Let Angel-Eco Tours be your guide on this two (or three) day exploration of Catatumbo / Lake Maracaibo and the surrounding areas in western Venezuela – visiting a number of different ecosystems along the way. The wildlife in this region is abundant and colourful as are as the characters that live in the palafitos or stilted houses on the edge of the expansive Lake Maracaibo. Experience the Catatumbo phenomenon which according to Wikipedia – the Catatumbo Lightning (Spanish Relámpago del Catatumbo) is an atmospheric phenomenon which occurs strictly in an area located over the mouth of the Catatumbo River where it empties into Lake Maracaibo. The frequent, powerful flashes of lightning over this relatively small area are considered to be the world’s largest single generator of tropospheric ozone, that is, ozone that does not replenish the stratospheric ozone layer. It originates from a mass of storm clouds that create a voltaic arc at more than 5 km of height, during 140 to 160 nights a year, 10 hours per day and up to 280 times per hour. 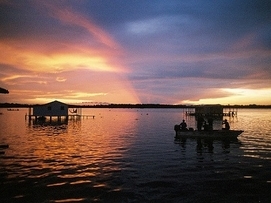 It occurs over and around Lake Maracaibo, typically over the swampish area formed where the Catatumbo River flows into the lake. 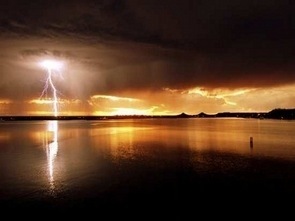 The first written mention of the Catatumbo lightning was in the epic poem “La Dragontea” (1597) by Lope de Vega, which recounts the defeat of English raider Sir Francis Drake. The phenomenon became so celebrated that it was depicted in the flag and coat of arms of the state of Zulia, which contains Lake Maracaibo, and mentioned in the state’s anthem. This phenomenon has been popularly known for centuries as the Lighthouse of Maracaibo, since it is visible for miles around Lake Maracaibo. Combine this exciting tour with Los Llanos for 6 days full of wildlife and amazing nature or with the Andean mountains and Páramos of Mérida! Guided tours run year-round. Departures usually arranged from Mérida and coordinated with other tours in the area. 2 days / 1 night suggested from Mérida. Overnight in hammocks in stilted houses (palafitos).